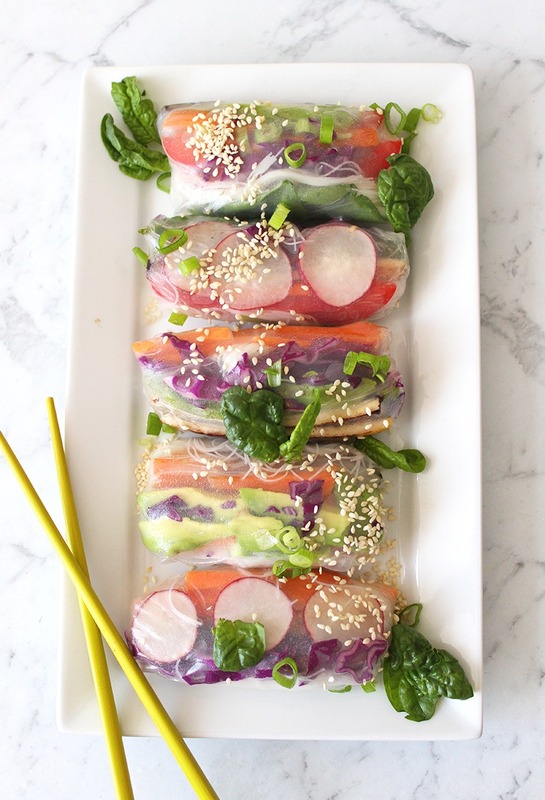 These Rainbow Summer Rolls are fresh and adorable with a crunchy veggie filling. They’re so much fun to make and equally as fun to eat. Serve as an appetizer or light lunch! 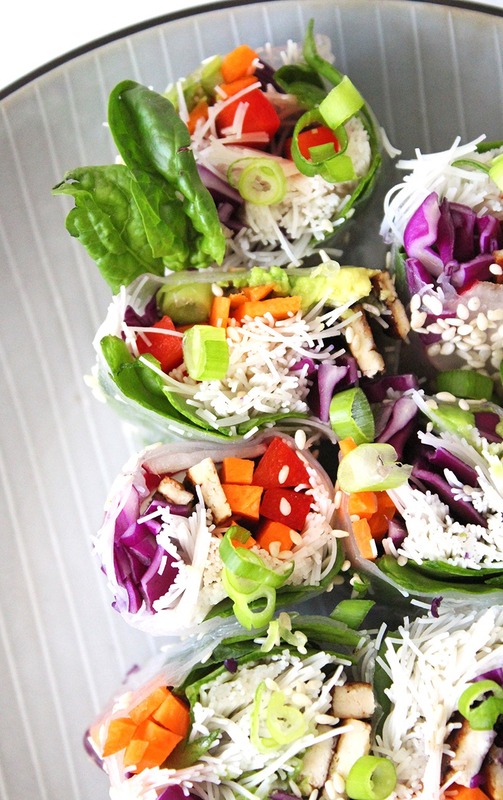 The beauty of making summer rolls or spring rolls is that you can fill them with whatever food you have on hand and whatever food you or the person you’re making them for like. Or you can try some crazy new combination of foods and have fun experimenting with the flavours if that’s your thing. I know it’s mine! With summer rolls, in particular, the most enjoyable part for me is all the vibrant colour. When I make them I aim for as much colour as possible so I end up using a larger variety of veg. Meaning they’re not only more delicious but also packed with nutrients. Win-win! 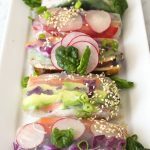 A summer roll is made with rice paper sheets and is left uncooked or “raw” so that the rice paper is left transparent, they’re filled with fresh ingredients and sometimes include fish or prawns. Whereas a spring roll is made with spring roll pastry and is baked or fried resulting in a crispy cream/brown casing. They’re both delicious appetizers and they both serve a different purpose depending on the mood you’re going for. The first step is to wet the rice paper sheet before you start filling it. To do this, place it into your shallow bowl and submerge it completely. Some people say to leave it for a minute or longer but I find this makes it too soggy and hard to handle, so I leave mine for only about 5-10 seconds. Then gently remove it and place it onto your damp tea towel. If it’s still a little stiff when you remove it from the water, don’t worry, it will soak up the water left on it while you’re filling it and become more pliable for rolling. Place your fillings in the center but slightly closer to you. Starting with the softer fillings like lettuce or rice noodles will prevent harder veggies like carrot from piercing the rice paper. 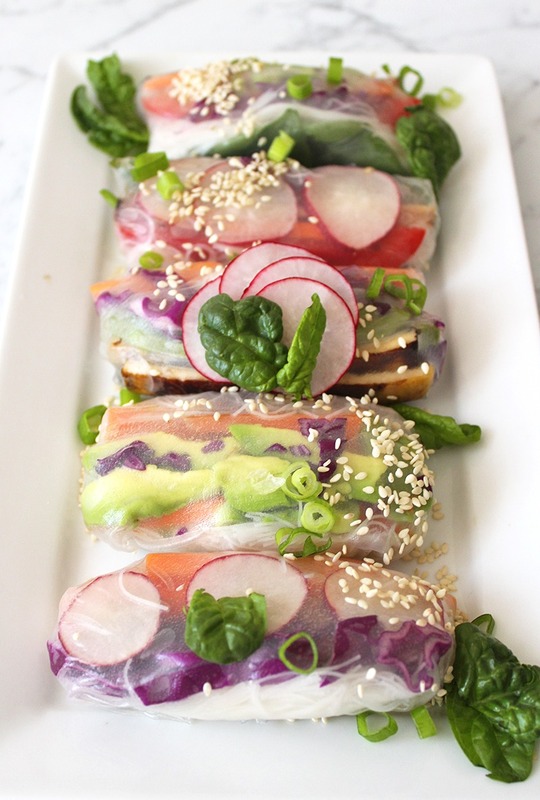 I then like to place the most colourful fillings on top to create a prettier summer roll. Just like a burrito, take the bottom edge (the side closest to you) and wrap that firmly up and over the fillings once, similar to how you would with a sushi roll. Then fold in each side flap and continue to roll the bulk of the roll right up to the top. Remember to keep practising and have fun with it. Best of luck my friend! Slice the firm tofu into thin strips and start to fry them in a well-oiled frying pan on medium heat. Once they’re looking a bit crispy, add the soy sauce or tamari and fry until it’s soaked into the tofu, flipping it occasionally. Pop the rice vermicelli into a bowl or container and fill with enough water to cover, then set aside while you prepare your fillings. Julienne the capsicum and carrot, slice the avocado, cabbage and radishes into thin strips and set aside with your baby spinach leaves. When the tofu is crispy and brown, remove it from the heat. Drain the rice vermicelli and set both with the other fillings. It’s important when making summer rolls to have everything prepped and set out before you start assembling them. So you should have in front of you, all your sliced veggies, tofu, drained rice vermicelli, a large plate or flat bowl with an inch of water in the bottom, your opened packet of rice paper sheets, and a damp tea towel to assemble the rolls on. To assemble each roll: place a rice paper sheet into the water so it’s covered for 5-10 seconds, gently remove and lay it on the damp tea towel. 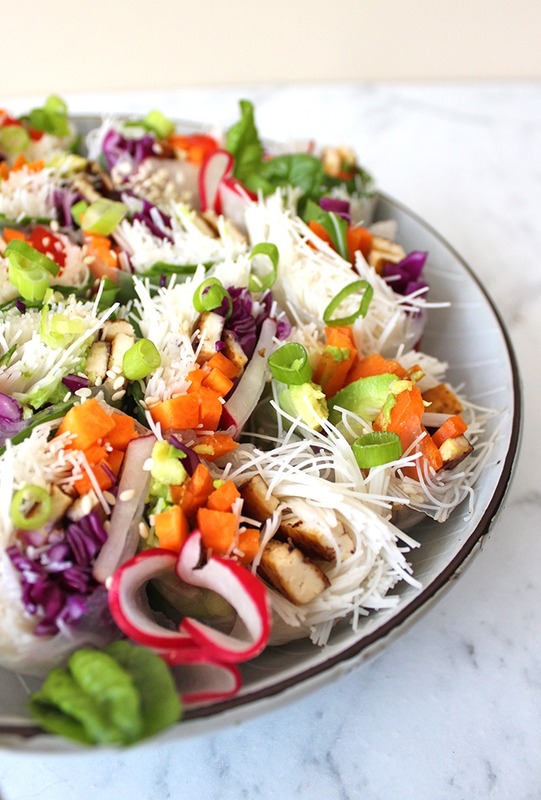 Place some rice noodles, veggies and tofu on top and gently roll. Scroll up for tips on assembling and rolling. Serve with a sprinkle of chopped spring onions and sesame seeds and a dipping sauce of your choice. Enjoy!